Learn the different aspects of testing a basic web table using the Katalon Studio automated testing framework in this quick tutorial. Handling web tables is perhaps much more complicated than any other elements or controls. A web table is a collection of rows and columns where data is stored in cells. Tables are used not only in data sheets but also in organizing web pages. table – indicates a table. tbody – defines a container for rows and columns. tr – specifies a row in the table. td / th – table data/table header indicating columns in respective table rows. There are several ways we can handle a web table. You want to get a text from a Web table and verify it. 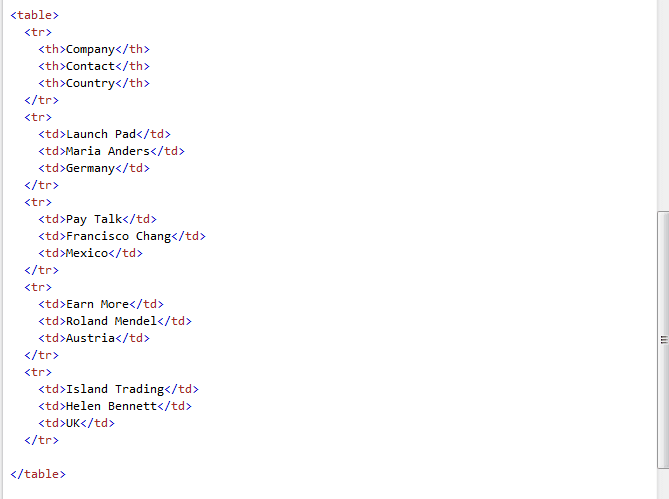 Scenario: Let’s say we need to find out which country the "Pay talk" company in the above table belongs to. First of all, we will find the location of the table, then we will store all table elements in the list. Next, we will run a loop and iterate through each row and column and capture the value in each cell. Switch to manual mode tab to view the test case step-by-step. Switch to manual mode tab to view test cases step-by-step. Examples above provide a basic understanding of how to handle web tables in Katalon Studio. If you are new to automation testing, it is recommended to take advantage of Manual Mode in Katalon Studio. For advanced testers, Script Mode provides you flexibility in creating and manipulating tests. Please download the source code here. For further instructions and help, please refer to Katalon Studio Tutorials and Katalon Forum.